Chad Owens (born April 3, 1982) is a professional Canadian football wide receiver and kick returner who is currently a free agent. He was most recently a member of the Hamilton Tiger-Cats of the Canadian Football League (CFL). He was drafted by the Jacksonville Jaguars in the sixth round of the 2005 NFL Draft. Owens played college football at Hawaii. He spent six seasons playing for the Toronto Argonauts, and has also been a member of the Montreal Alouettes and Saskatchewan Roughriders. Owens attended Roosevelt High School in Honolulu, Hawaii, and he was a three-sport letter-winner and star in football, basketball, and Track. In football, as a senior, he was an all—OIA white division selection, and an All-State honourable mention. As a sophomore, he garnered first team All-OIA Red Division honours, and All-State honourable-mention accolades. He was also a basketball star and as a senior, he led his team to the OIA state basketball championship. He has three children: Chad Jr., Arena, and Sierra-Lynn with his former spouse. Owens became a bigger star after joining the University of Hawaii football team as a wide receiver, punt returner and kick returner. He became the featured receiver in June Jones's Run & Shoot Offence, and became the number one receiver for quarterback Timmy Chang. Owens was instrumental on the Warriors teams that won both the Hawaii Bowl in 2003 and 2004 by beating the University of Houston and the University of Alabama at Birmingham. Owens was cut by the Jacksonville Jaguars after his NFL debut against the Indianapolis Colts where he muffed three punts. He was re-signed to the Jaguars' practice squad a few days later. Playing with the Jaguars in his first pre-season game of the 2006 season, Owens caught a 62-yard pass and scored his first NFL touchdown. Owens signed with agent Richard "Bruno" Burnoski and signed a contract with the Colorado Crush of the Arena Football League. Owens got off to a fast start with the Crush, generating over 1600 combined yards (receiving and returns) but tore his ACL, ending his season after nine games. On July 14, 2009, Owens signed a practice roster agreement with the Montreal Alouettes. He was released on October 1. He was re-signed to the practice roster on October 8 and was considered a part of the 2009 Grey Cup Championship team for participating in a game during the regular season. On June 24, 2010, the Toronto Argonauts acquired Owens from the Alouettes in exchange for a fourth-round pick in the 2011 CFL Draft. On November 25, 2010, Owens was named the most outstanding special teams player in the Canadian Football League for the 2010 season. Owens was a unanimous selection after leading the CFL in punt, kickoff, missed field goal returns and all-purpose yards and finishing tied for the league lead in return touchdowns (four). He became just the fifth player in league history to have over 1,000 punt and kick return yards in a season. On November 1, 2012, in the final regular-season game against the Hamilton Tiger-Cats, Owens set the all-time record for all-purpose yards in a single season, surpassing Pinball Clemons' 1997 total of 3,840 yards. Owens did so with a 29-yard kickoff return halfway through the 2nd quarter. He finished the season with 3863 all-purpose yards, setting not only a CFL record, but also a professional football record as well. In his third full season in Toronto, Owens became the first player in professional football to record at least 3,000 combined yards in back-to-back seasons. On November 22, 2012, Owens won the CFL Most Outstanding Player Award finishing ahead of Calgary Stampeders running back Jon Cornish in voting conducted by the Football Reporters of Canada as well as the eight CFL head coaches. On November 25, 2012, Owens and the Argonauts finished the 2012 season with the 100th Grey Cup Championship. Owens was rated the best player in the league on the TSN Top 50 players of 2012. On June 8, 2013, the Argos and Owens agreed to a two-year contract extension. The deal was rumoured to make Owens the highest-paid non-quarterback in the CFL. The Argonauts did not resign Owens at the conclusion of the 2015 CFL season, rendering Owens a free agent. On February 11, 2016, Owens agreed to a one-year contract with the Hamilton Tiger-Cats as a free agent. Subsequently, it was announced on October 4, after playing 12 games with the Tiger-Cats, that Owens would miss the remainder of the 2016 CFL season due to a broken foot he sustained in a game against the Montreal Alouettes. He would subsequently re-enter Free Agency after only a season with the organization. On February 15, 2017, Owens agreed to a two-year deal with the Saskatchewan Roughriders. It was announced, on June 21, 2017, that Owens was placed on the six-game injured list due to an apparent foot injury he likely sustained while with the Tiger-Cats. Owens made his Roughriders debut on October 20, 2017 in a winning effort against the Calgary Stampeders recording five receptions with seventy eight yards. Despite his strong performance at the end of the 2017 Saskatchewan Roughriders campaign, he was part of final roster cuts for the Riders on June 9, 2018. His age and performance relative to younger players are believed to be contributing factors affecting the decision to cut ties with the player. Owens returned to the Hamilton Tiger-Cats when he signed a practice roster deal on September 11, 2018. He was released on October 1, 2018 without having played in a game. In the off-season following the 2012 CFL season, Owens decided to pursue MMA as a form of off-season training. Then Argos GM Jim Barker openly expressed his displeasure with Owens's fighting in MMA, and was quoted as saying, "I think he's making a bad decision, our organization thinks he's making a bad decision". On April 6, 2013, Owens defeated Junya Tevaga by unanimous decision in an amateur bout. The organization that oversaw the fight was Destiny MMA. In January 2015, Owens moved from Hawaii to Canada full-time; he now resides in Mississauga, Ontario. ^ Davidson, Neil (November 2, 2012). "Owens sets pro football all-purpose yards mark". Sympatico.ca. Retrieved November 2, 2012. ^ "Horton: Top 10 rookies of 2008". ESPN.com. July 15, 2008. Retrieved May 13, 2017. ^ "1 on 1 with Chad Owens". ^ "Argos make a deal with the Alouettes". CFL.ca. June 24, 2010. Retrieved May 13, 2017. ^ "Video: CFL State of the League". CFL.ca. November 25, 2005. Retrieved May 13, 2017. ^ "404". TSN. Retrieved May 13, 2017. 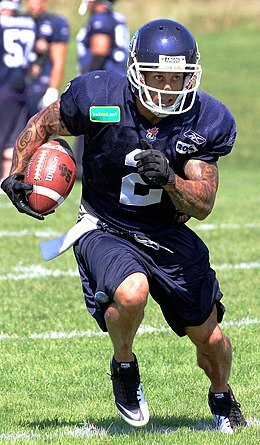 ^ "Former CFL MOP Chad Owens signs with Tiger-Cats". ^ "Ticats Chad Owens to miss the rest of season due to injury". October 4, 2016. ^ "Aloha Riderville! : Chad Owens signs with Saskatchewan". CFL.ca. February 15, 2017. Retrieved February 16, 2017. ^ "Riders WR Owens on six-game injured list - TSN". ^ "Revitalized Owens Shines in Riders debut". ^ "Veterans Bagg, Owens, Grant and Bond among Riders cuts - CFL.ca". CFL.ca. June 9, 2018. Retrieved June 11, 2018. ^ "Tiger-Cats sign Chad Owens to practice roster - CFL.ca". CFL.ca. September 11, 2018. Retrieved September 11, 2018. ^ "Tiger-Cats transactions". ticats.ca. October 1, 2018. Retrieved October 1, 2018. ^ "Owens comes out victorious, unscathed in MMA debut". CFL.ca. April 4, 2013. Retrieved May 13, 2017. ^ Ralph, Dan (January 8, 2015). "Argonauts star Chad Owens, family make full-time move to Canada". CTVNews.ca. Retrieved May 13, 2017.